While having a clear out of old MBR and MBUK magazine, my son and I cut out all the route guides and I “filed” them for future use. Spotting a ride in Wiltshire I immediately began to think of using it as a club ride. Some research into the area made what looked like a pleasant woodland ride into something a little more interesting so I pitched the ride and set about amending the route found in MBR to explore the woodland further. I knew the map like the back of my hand. However, I had not been able to do a recce of the route, my summer holiday was coming and the day of the ride was looming closer. Much research had been put in to locate the infamous Handsel Trees and the munitions bunker so I felt I knew the route and the location reasonably well. But in accordance with club rules, a ride leader must have ridden the route to check for any major changes in conditions, likely diversions, fallen trees etc and to generally make sure it was safe and suitable. Perhaps a little late (or in this case early) in the day, I decided to do the recce ride on the morning of the ride itself! Getting up extra early and being greeted with dry conditions I had high hopes for a great day out and 2 laps of the trails. At around 6.30am I set off from Wylye up the road to Grovely Wood with the sun rising behind me. With a copy of my route in hand I set about following it and investigating some additional single track discoveries on the way. Everything was going according to plan. The Roman Road through the forest was indeed very long (over 4 miles) and straight, dropping off and on to it on various forest tracks kept it interesting and fun. 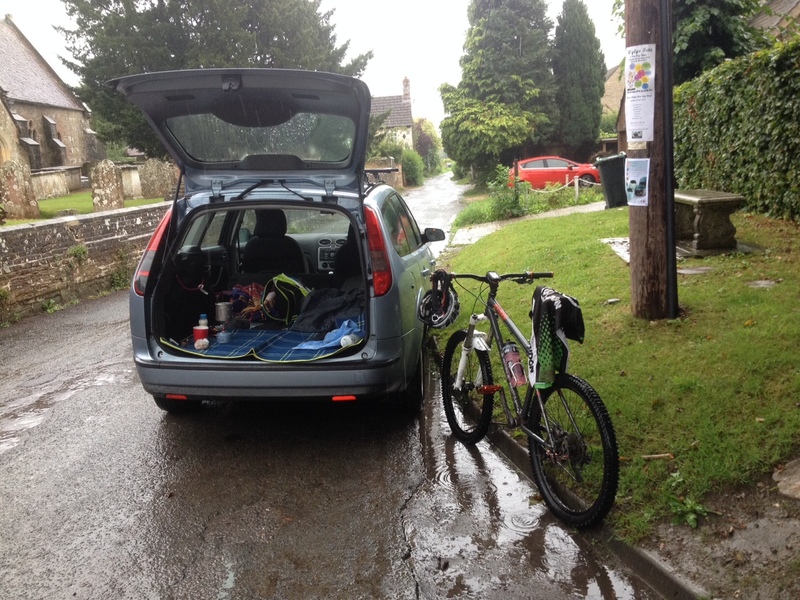 As I had hoped the 2km section down Hadden Hill in to Great Wishford proved to be a thrilling descent. First in the woods and then out into the open with great views of the South Wiltshire downlands. A pedal up the parallel road/track back into the woods and I was loving the ride and feeling a huge amount of satisfaction that it was all going so well. Then came the hunt for the bunker – how could the ride be complete without the Warhead section of the title? Much research had been done to find the bunker – later discovered to be a Stanton Air Raid Shelter – and I was sure I would find it. Well, I didn’t. I was very disappointed, as this was going to be one of the highlights of my ride! Onwards and upwards – I got back on track and continued to enjoy the woodland trails and downland views. It even looked like the rain was going to hold off. Then suddenly BOOM! Thunder. Or was I on Salisbury Plain and being fired at? Nope, that was thunder and here comes the rain. Heading straight for tree cover, why wasn’t there any tree cover? I was in a forest! The rain was so heavy that I think I was soaked through in about 2 minutes. Deciding to keep my coat dry I I left it in my bag, pedaled on in my T shirt dripping wet. I found the Handsel Trees. These gnarly old beech trees eerily stand out among the firs in Grovely Wood and supposedly mark the graves of 4 witches bludgeoned to death and buried in the woods for cursing the nearby village of Wilton in 1737. 132 people died from an outbreak of small pox in the village soon after the sisters arrived from Denmark – so they must have been to blame! The area has a subsequent reputation for paranormal activities and is said to be haunted – if you believe that sort of thing of course. I followed my planned route back to my car, changed out of my wet clothes, made a cup of tea and awaited the arrival of the days riders. It was 10am and there was no sign of anyone in the village. I wasn’t surprised, the weather was rubbish and waking up to go and ride in this weather is not what we like to do. We talk about manning up and “Rule number 5″ but in reality who really enjoys doing this, and chooses to be dragged around a wet muddy woodland on a Sunday morning? Just about to give up and go home I spot 2 unfamiliar faces readying bikes. 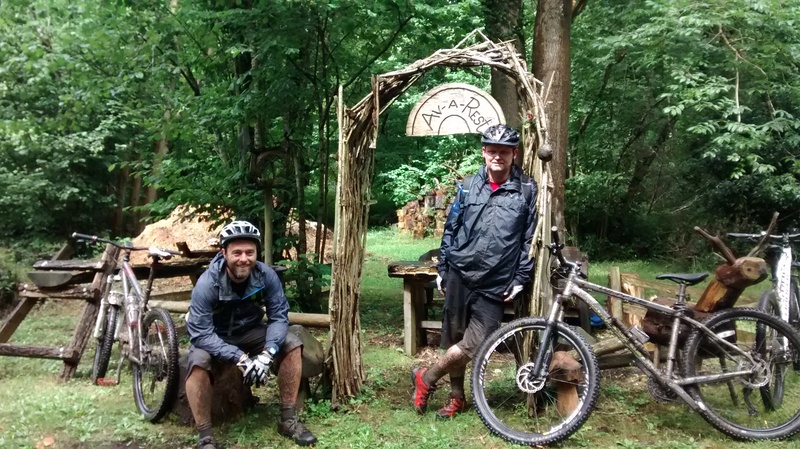 My heart sank – “I’m going to have to do that all again now…” But I was buoyed by the enthusiasm from these guys who had journeyed an hour in the pouring rain to venture on to their first MB Swindon club ride. There was also some relief and pleasure in knowing that someone else was going to get as soaked as I was. Grovely Wood has some great little trails running through it and even in the wet, muddy conditions we had a great time with the added challenge of judging the depth of puddles and rapidly filling ruts! 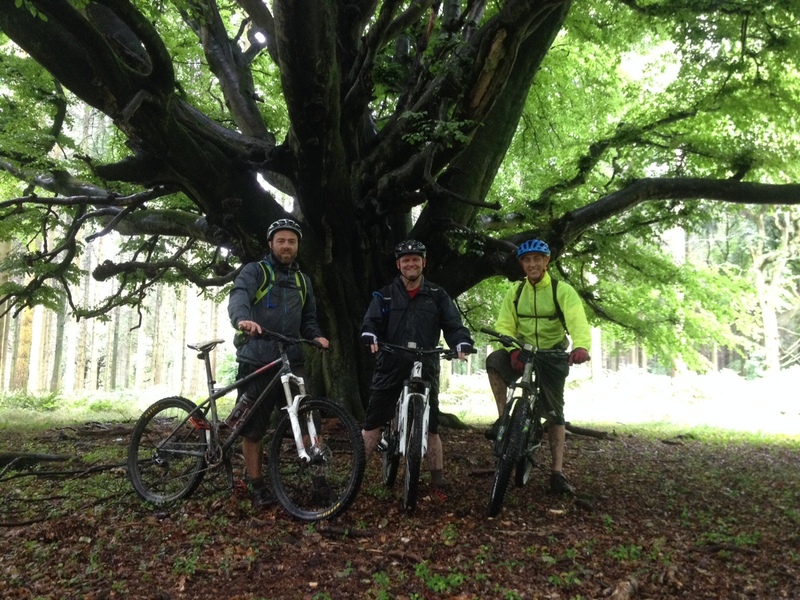 I billed the ride as a Novice ride – it was possibly a stretch but Matt and Dave were more than capable of the task. The location and trails are such that changes could be made on the fly and I did make one or two because of the weather, not rider’s abilities. Chalky downland descents in the wet are treacherous and after one with a few lucky escapes, I made the call that we would miss out the others. Water was gushing down the hill side tracks, loosening stones and gravel and adding a slick finish to the nice chalky bits. I opted to leave off the final off descent in favour of a much safer tarmac road where the 3 of us finished the 20 mile ride with a blast at 30 mph back to the village of Wylye for a pint in the Bell Inn. The woodland will make a stunning spot in the Autumn (and the Spring for that matter) and I plan on returning and with some additional research we will find that air raid shelter! Final word or thanks and much kudos for Dave and Matt for making the effort in the awful conditions and joining me on the ride. Hope to see you guys again soon. This ride was an MB Swindon club ride with maps sourced from MBR magazine, originally mapped by Tom Hutton. The four Handsel sisters were of Danish origin but they had moved to the Wilton area. Coincidentally, an outbreak of smallpox in 1737 killed 132 people. The local people became convinced that the sisters were responsible for the deaths and accused them of witchcraft and an alliance with the devil. Without an official hearing the sisters were taken to Grovely Wood, murdered by being bludgeoned over the head, and buried a little way apart from each other so that they could not conspire against their murderers. There are four gnarled beech trees associated with the sisters; because either the trees were planted to mark their graves or they mysteriously grew on top of the unmarked graves to remind the locals of their dreadful deed. Sightings of the sisters have been reported over the years. There is a hollow at the back of the largest tree where people leave offerings. The trees are located approximately 50 meters away from the Roman road some ten minutes walk from the Wilton end of the wood.